Gov. Doug Ducey signed SB1059, continuing the Arizona Oil & Gas Conservation Commission for 6 years, until July 1, 2022. The Sunset Review panel had originally recommended an 8 year continuation but the Arizona House cut that to match the Sunset Review for the Dept. of Environmental Quality. Gov. Ducey has proposed shifting the duties to provide technical and admin support to the Commission from AZGS to ADEQ, starting July 1, 2016, as part of his consolidation plans which involve transferring the AZGS duties to the University of Arizona. 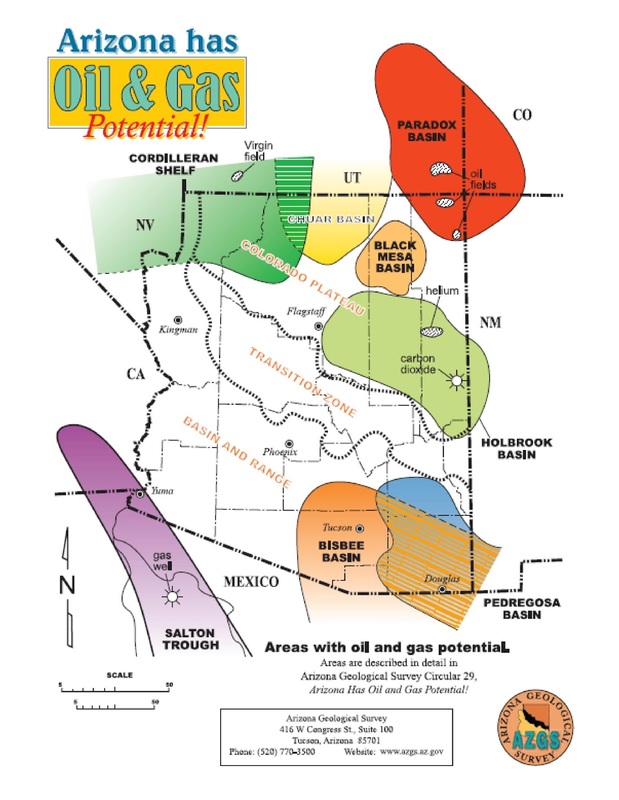 In July 1991, the Legislature eliminated the Arizona Oil and Gas Conservation Commission (OGCC) agency and attached the OGCC governing board to the Arizona Geological Survey (AZGS). The OGCC consists of the State Land Commissioner and five members appointed by the Governor, only three of whom may be of the same political party. Appointed members must be United States citizens and Arizona residents of at least five years (A.R.S. § 27-514). The OGCC administers and enforces state laws with the purpose of: 1) conserving and preventing waste of oil, gas and geothermal resources; 2) providing for protection of owners of land wherein these resources lie; 3) encouraging responsible development of these resources; 4) encouraging a continuous and economic supply of and demand for these resources; and 5) safeguarding the health, property, environment and public welfare of the citizens of this state (A.R.S. § 27-502). The OGCC fulfills its mission by: 1) issuing permits for oil, gas and geothermal wells; 2) monitoring and inspecting wells and facilities for compliance with rules; 3) maintaining rules; 4) compiling and maintaining drilling, production and subsurface data for public use; 5) coordinating enforcement with the Attorney General; and 6) preparing and publishing geologic studies to encourage exploration for and development of Arizona’s oil, gas and geothermal resources.